A Scarab assembly facility within the forges. The Assembly Forges refer to the various manufacturing facilities of the Covenant, individually referred to as an assembly forge. These facilities produced items piece-by-piece using clouds of programmable nanomachines. These nanomachines were fed instructions via a design pattern, maintained by artisan-armorers. An imperfect replication of the assembler vats once used by the Forerunners, assembly forges are susceptible to mutations in design patterns, unaccounted variance in feedstock material, and transcription errors. The mutation of a design pattern often required the resetting of the forge that had attempted to produce the design. The Assembly Forges produced numerous matériel—ranging from weapons, vehicles, shuttles, and starships—for the Covenant war machine. Due to advanced manufacturing methods applied by fabrication plants like Assembly Forges, the Covenant deliberately avoided rigid standardization and mass production of their starships. While considered a separate entity from the Assembly Forges, the Ministry of Preparation's Sacred Promissory operated assembly forges. After the fall of High Charity during the Great Schism in November 2552, the Swords of Sanghelios and successor factions of the Covenant are forced to turn to independent assembly forges for equipment. 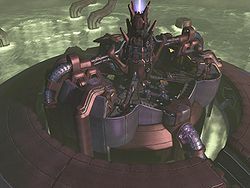 The Primary Assembly Forges were a series of expansive manufacturing forges and refineries, notably the Assembly Forges located in the Covenant holy city of High Charity. Considered to be the greatest and most capable assembly forges within the empire, High Charity's vast forge labored to meet the demands of the capital and supply the armies of the Covenant. Secondary Assembly Forges manufactured light warships and attack ships, such as the CRS-class light cruiser. Tertiary Assembly Forges are primarily used for the manufacturing of space fighters, dropships, small arms, vehicles, and other equipment. Some of these forges are built aboard DSC-class support ships, producing weapons, maintenance kits, food packs, and clothing for the fleet the support ship is attached to. The Halo 3 multiplayer map Assembly occurs within a Scarab-constructing facility in the forges. A section of a Scarab manufacturing plant. The beam of light the presumably powers the manufacturing plant. A corridor on Assembly Forges.